Reserve Bank of New Zealand Governor Graeme Wheeler and his gang of policymakers refrained from taking any action in their previous decision, but are they about to announce a rate cut this time? Here are some things you should keep in mind if you’re planning on trading this event. 1. Several analysts are expecting a 0.25% cut. A good number of economic gurus had already been counting on a 0.25% interest rate cut in the April RBNZ monetary policy statement because the New Zealand economy had been in pretty rough shape then. Even though these doves were sorely disappointed to find out that central bankers thought it best to sit on their hands then, it seems as though the decision to hold at that time only fueled stronger expectations for a rate cut this month. Most forex calendars are showing a consensus of a cut from 2.25% to 2.00% especially since the RBNZ did mention that additional easing could be necessary to help the economy achieve its inflation goal. Maybe the RBNZ just paused from cutting in April because it already lowered interest rates last March? “Further policy easing may be required to ensure that future average inflation settles near the middle of the target range,” said RBNZ head honcho Wheeler. But are New Zealand’s inflation numbers still looking grim? 2. Economic data has shown some improvements. If you’ve already seen my latest Economic Snapshot on the New Zealand economy, then you probably remember that the quarterly inflation figures weren’t all that bad. Headline CPI for Q1 2016 showed a 0.2% uptick, twice as much as the projected 0.1% increase and much better than the previous period’s 0.5% decline. Core CPI was up 0.4%, reflecting an improvement from the earlier flat reading. The dairy industry has been doing well so far, as the last two Global Dairy Trade auctions reflected gains in prices. Producer prices have also hinted at smaller drags on consumer inflation down the line while inflation expectations have held steady. Apart from that, business indicators have shown a rebound in momentum after a weak performance earlier in the year. Hiring has picked up by 1.2% in Q1 while increased labor force participation reflected better confidence in the jobs sector. On the flip side, consumers don’t seem to be too optimistic about these improvements just yet, as quarterly retail sales and consumer confidence levels have dropped. Trade activity also appears feeble, as exports slumped 14% in March while imports tanked 3.7%. 3. No housing market controls… yet. As the RBNZ keeps mentioning in its recent policy statements, strong housing inflation has been one of the main factors preventing them from lowering rates too quickly. After all, this could encourage more housing investors to take advantage of cheap mortgage rates in buying property, thereby sapping up supply and driving home prices even higher. New Zealand Finance Minister Bill English has already highlighted this concern ahead of the RBNZ Financial Stability Report, citing that the central bank might need to implement measures to curb housing demand such as tighter loan-to-value ratio (LVR) controls. However, the RBNZ stopped short of introducing any new macro-prudential tools in their May Financial Stability Report while cautioning that imbalances in the housing market are contributing to financial risk. Should the RBNZ decide to sit on its hands again, the Kiwi might be in for yet another relief rally. By the looks of it, there are strong arguments for either cutting rates or standing pat so the actual announcement might trigger a large reaction. 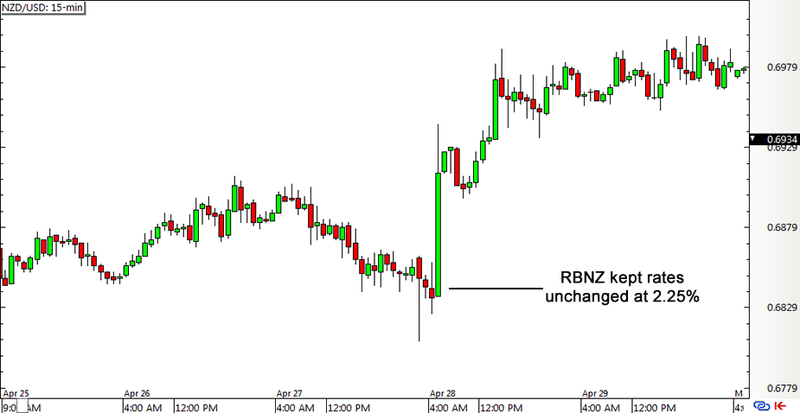 NZD/USD surged by nearly a hundred pips as soon as the RBNZ announced its decision to hold. The pair carried on with its climb throughout the day and for the rest of the week, as traders likely closed out their short bets. Do you think we’ll see a similar scenario this time?